In front of his home country of Bulgaria, competing for the first time after an 18-month layoff, Kubrat Pulev dominated Hughie Fury for a unanimous decision win in an IBF heavyweight title eliminator. With Pulev victorious, he now becomes the No. 1 contender and could possibly be the one who faces WBA/IBF/WBO/IBO Heavyweight Champion Anthony Joshua at Wembley Stadium on April 13. Fury was the one in control for most of the opening round as Pulev seemed to struggle to get past the jab until answering late in the round. Pulev continued to struggle to get anything going at the start of the second, trying to figure out the awkward stance Fury had similar to that of his cousin Tyson. But a strong left hand opened up a cut over Fury’s eye, forcing the doctor in during the closing seconds of the round. Fury out aggressively in the third, trying to get the finish before the cut can get any worse. Pulev countered by doing a lot of clinching and tying up Fury. Fury managed to work over Pulev’s body when he wasn’t getting clinched, but the cut looked to be a major concern. Pulev then came out the aggressor in the fourth, trying to finish the fight or make Fury’s cut impossible to work with, and the fight turned into a scrap fest. With the fight in this kind of style, Pulev took control in the fifth not allowing Fury to get much damage on him. After a quiet sixth round, the seventh saw Fury focus on counter-punching and retreating. He paid for it by eating several left hands, including one that noticeably rocked him. 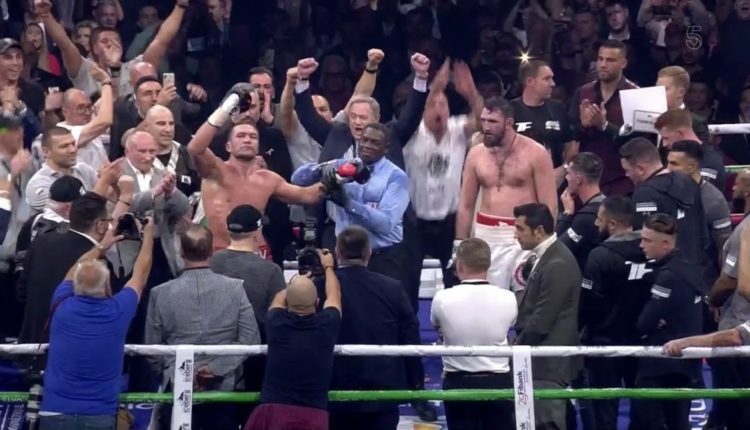 Fury, however, did manage to rock Pulev early on in the round, turning up the tempo and becoming more aggressive before the referee separated the two and warned for punches to the back of the head. Pulev did not seem to be 100 percent by the end of the round, and he couldn’t take back control of the fight. That turned out to be a one-time thing for Fury, as everything returned to how the fight was progressing in the ninth. Fury missed continuously with the right hand again, while Pulev returned to clinching and got back on his front foot, landing a couple of left-hand combinations once again and knocking Fury off balance, though not down. Fury was rocked again in the 10th, and by this point, it seemed he had nothing left. While he landed a key couple of punches in the final rounds, there was nothing more he could do and failed to get a knockdown. All three judges gave the bout to Pulev, with scores of 117-111, 118-110, 115-113.